This is the 1942-45, 1990-91 Anniversary patch for the 4th FS that currently fly the F-16 'Fighting Falcon'. This is the desert version of the current squadron patch for the 4th Fighter Squadron. 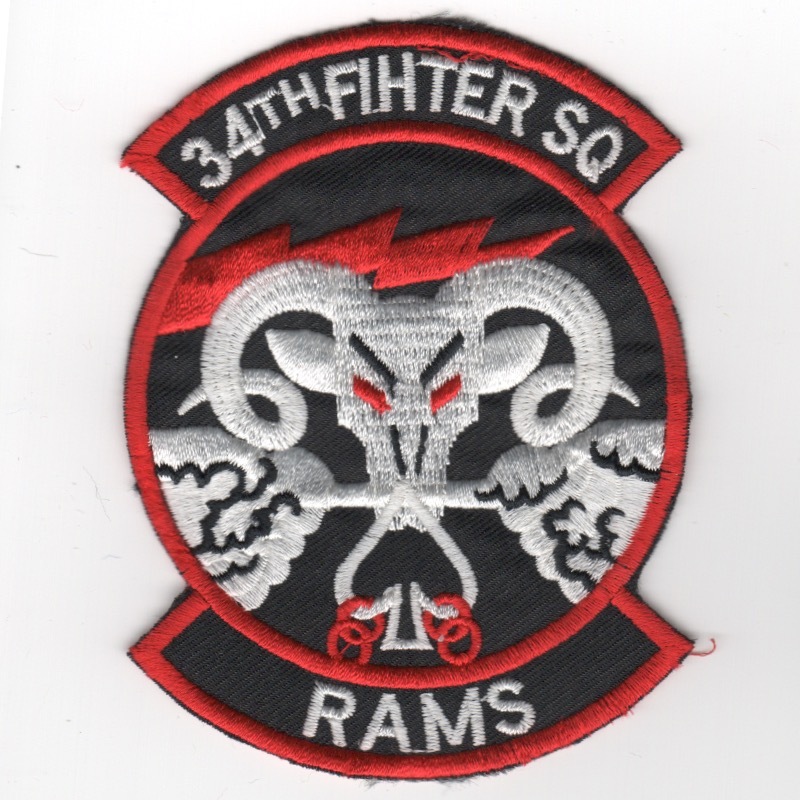 This patch is from the 4th Fighter Squadron and is indeed from Hill AFB Utah. It was first used in 1999 to 2000 while deployed to Al-Jaber Air Base, Kuwait. (Korean): The USAF 8FW is the host unit at Kunsan Air Base, Republic of Korea and is assigned to Seventh Air Force, which falls under Pacific Air Forces (PACAF). 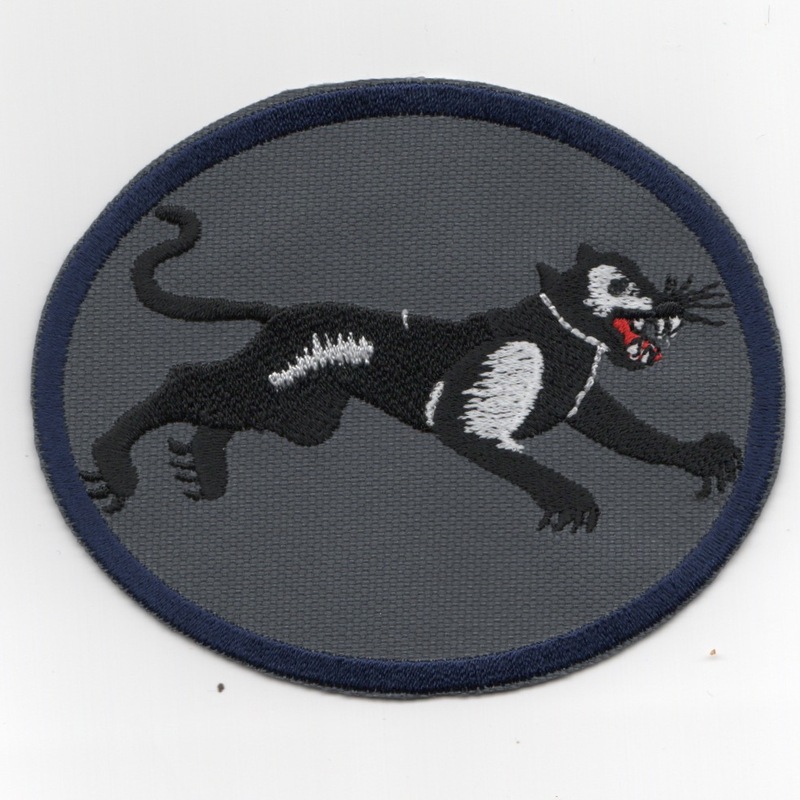 The Wing's 8th Operations Group is the successor of the 8th Pursuit Group, one of the 15 original combat air groups formed by the Army before World War II. Established in Japan after World War II in 1948, the wing flew combat missions throughout the Korean War, then were redesignated the 8th Tactical Fighter Wing in 1958, it remained in Japan until 1964. After a year in California, it moved to Southeast Asia, where its F-4 Phantom II crews earned the nicknames "MiG killers" and "bridge busters". In 1974 the wing relocated to Kunsan Air Base, South Korea, where it was redesignated the 8th Fighter Wing in 1992. This patch was found in a Korean embroidery shop in very limited quantities and does not come with velcro attached. (Korean): The 13FS is a fighter squadron of the USAF flying the General Dynamics F-16 Fighting Falcon and is part of the 35FW at Misawa Air Base, Japan. 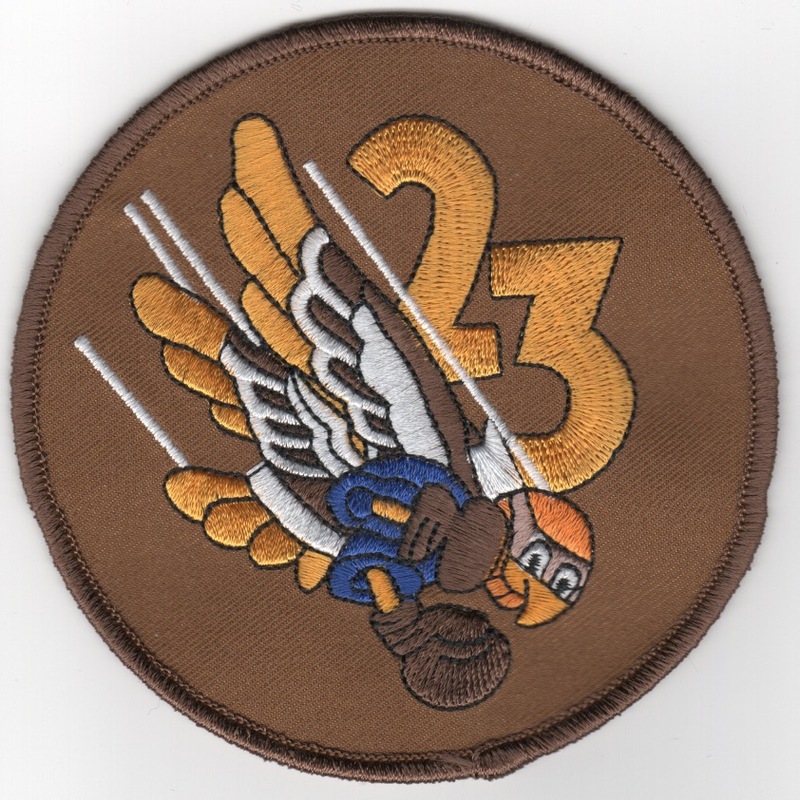 The squadron traces its heritage back to the 1942 activation of the 313th Bombardment Squadron. The squadron served in the United States as a training unit until its 1943 inactivation. The squadron was reactivated in 1966 as the 13TFS, fighting in the Vietnam War. The squadron flew Wild Weasel anti-SAM missions with the Republic F-105 Thunderchief and McDonnell Douglas F-4 Phantom II, operating out of Korat Royal Thai Air Force Base. The squadron moved to Udorn Royal Thai Air Force Base in October 1967, flying F-4s in combat air patrols against North Vietnamese MiGs and ground strike missions. The squadron was then inactivated with the end of the war in 1975. The squadron was reactivated in 1976 as a training squadron at MacDill AFB, FL, and then inactivated again in 1982. 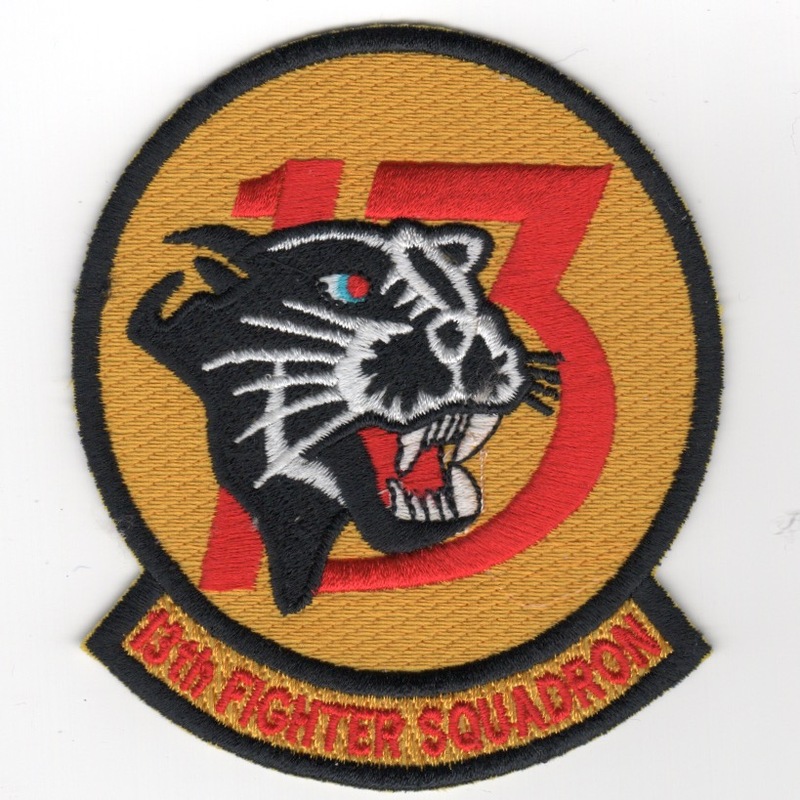 The squadron was (again) reactivated as the 13TFS in 1985 at Misawa, flying the F-16, finally being redesignated the 13th Fighter Squadron in 1991. This patch was found in a Korean embroidery shop in very limited quantities and does not come with velcro attached. (Korean): The 13FS is a fighter squadron of the USAF flying the General Dynamics F-16 Fighting Falcon and is part of the 35FW at Misawa Air Base, Japan. The squadron traces its heritage back to the 1942 activation of the 313th Bombardment Squadron. The squadron served in the United States as a training unit until its 1943 inactivation. The squadron was reactivated in 1966 as the 13TFS, fighting in the Vietnam War. The squadron flew Wild Weasel anti-SAM missions with the Republic F-105 Thunderchief and McDonnell Douglas F-4 Phantom II, operating out of Korat Royal Thai Air Force Base. The squadron moved to Udorn Royal Thai Air Force Base in October 1967, flying F-4s in combat air patrols against North Vietnamese MiGs and ground strike missions. The squadron was then inactivated with the end of the war in 1975. The squadron was reactivated in 1976 as a training squadron at MacDill AFB, FL, and then inactivated again in 1982. 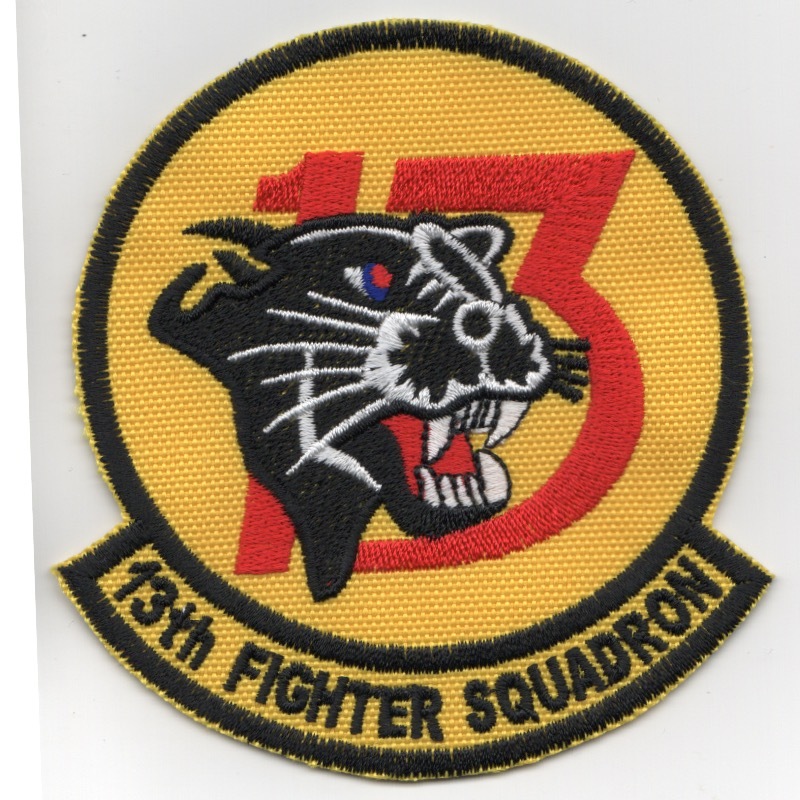 The squadron was (again) reactivated as the 13TFS in 1985 at Misawa, flying the F-16, finally being redesignated the 13th Fighter Squadron in 1991. This patch was found in a Korean embroidery shop in very limited quantities and does not come with velcro attached. I ONLY HAVE ONE, SO IF YOU WANT IT, YOU HAVE TO EMAIL ME!! (Korean): The 14FS is part of the 35FW at Misawa Air Base, Japan. They operate the F-16 Fighting Falcon aircraft conducting Wild Weasel missions. The squadron has been stationed at Misawa since 1987. The squadron was deactivated, but then reactivated in 1987 as the 14TFS at Misawa Air Base, initially training for close air support using conventional weapons. They also provided for the air defense of northern Japan. The squadron has provided personnel and aircraft to support operations in Iraq and Afghanistan. This patch was found in a Korean embroidery shop in very limited quantities and does not come with velcro attached. (Korean): The 14FS is part of the 35FW at Misawa Air Base, Japan. They operate the F-16 Fighting Falcon aircraft conducting Wild Weasel missions. The squadron has been stationed at Misawa since 1987. The squadron was deactivated, but then reactivated in 1987 as the 14TFS at Misawa Air Base, initially training for close air support using conventional weapons. They also provided for the air defense of northern Japan. The squadron has provided personnel and aircraft to support operations in Iraq and Afghanistan. 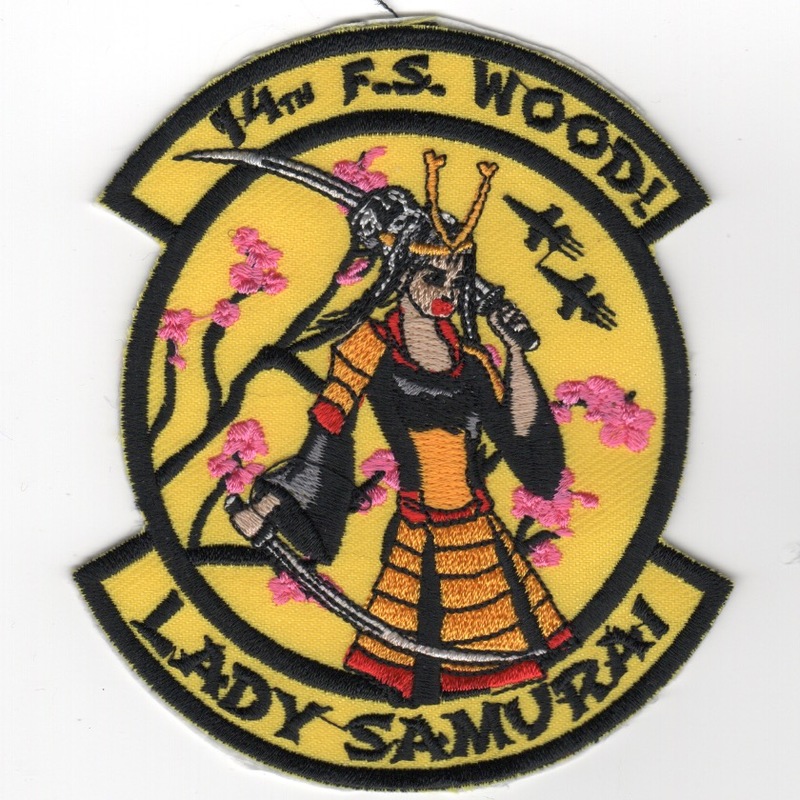 This patch is the "LADY SAMURAI" version of their squadron patch and was found in a Korean embroidery shop in very limited quantities. This patch does not come with velcro attached. (Korean): The 14FS is part of the 35FW at Misawa Air Base, Japan. They operate the F-16 Fighting Falcon aircraft conducting Wild Weasel missions. The squadron has been stationed at Misawa since 1987. The squadron was deactivated, but then reactivated in 1987 as the 14TFS at Misawa Air Base, initially training for close air support using conventional weapons. They also provided for the air defense of northern Japan. The squadron has provided personnel and aircraft to support operations in Iraq and Afghanistan. 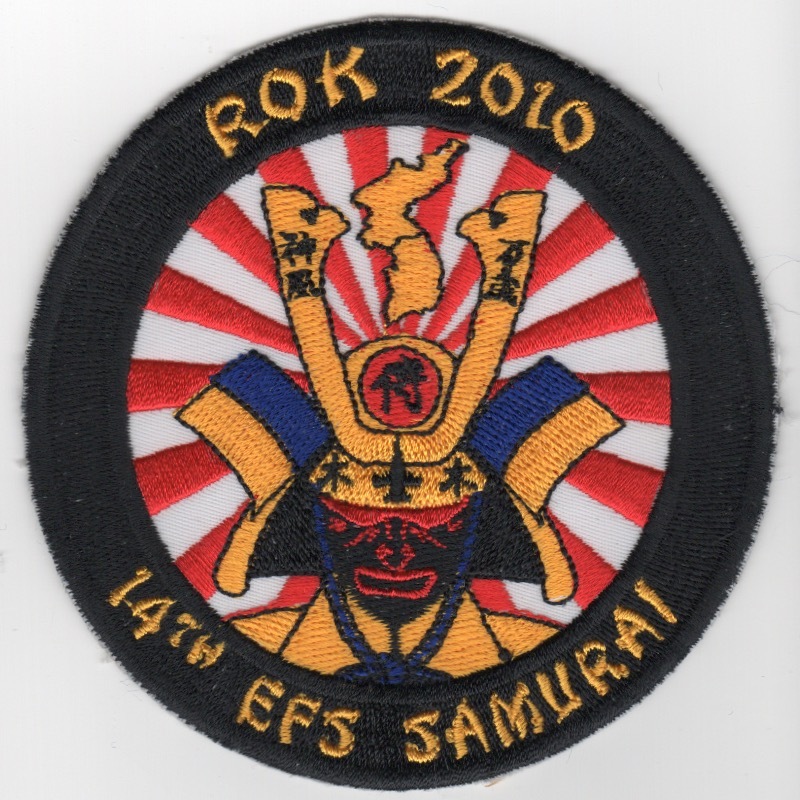 This patch is the "2010 ROK" patch and was found in a Korean embroidery shop in very limited quantities. This patch does not come with velcro attached. (Korean): The 14FS is part of the 35FW at Misawa Air Base, Japan. They operate the F-16 Fighting Falcon aircraft conducting Wild Weasel missions. The squadron has been stationed at Misawa since 1987. The squadron was deactivated, but then reactivated in 1987 as the 14TFS at Misawa Air Base, initially training for close air support using conventional weapons. They also provided for the air defense of northern Japan. 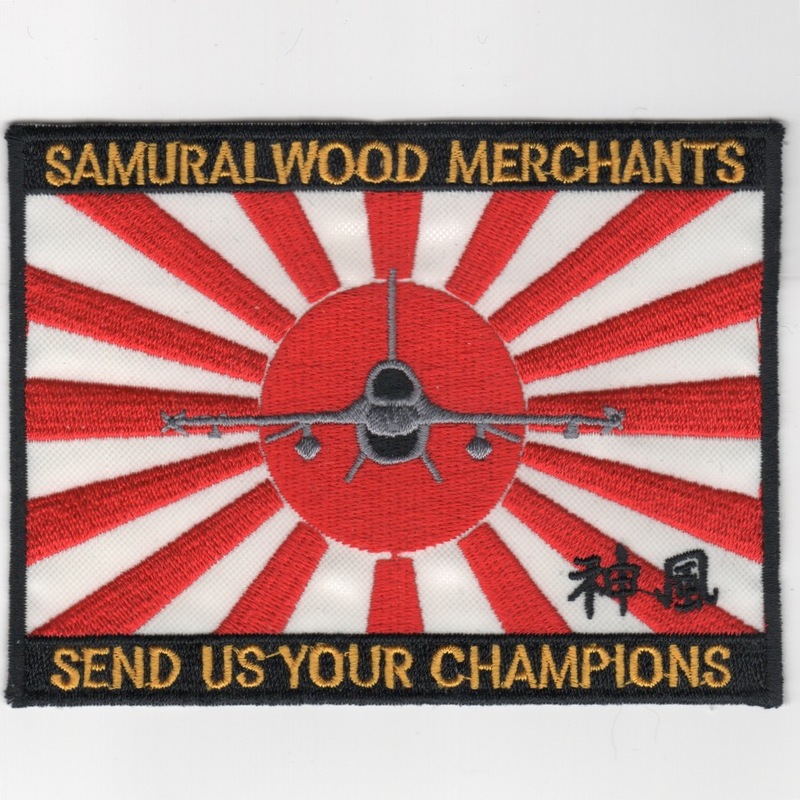 This patch is the "Red-White Sun Ray" version of their "WOOD MERCHANT" patch and was found in a Korean embroidery shop in very limited quantities. This patch does not come with velcro attached. In Stock: TWO! Email me before ordering!! (Korean): The 14FS is part of the 35FW at Misawa Air Base, Japan. They operate the F-16 Fighting Falcon aircraft conducting Wild Weasel missions. The squadron has been stationed at Misawa since 1987. The squadron was deactivated, but then reactivated in 1987 as the 14TFS at Misawa Air Base, initially training for close air support using conventional weapons. They also provided for the air defense of northern Japan. 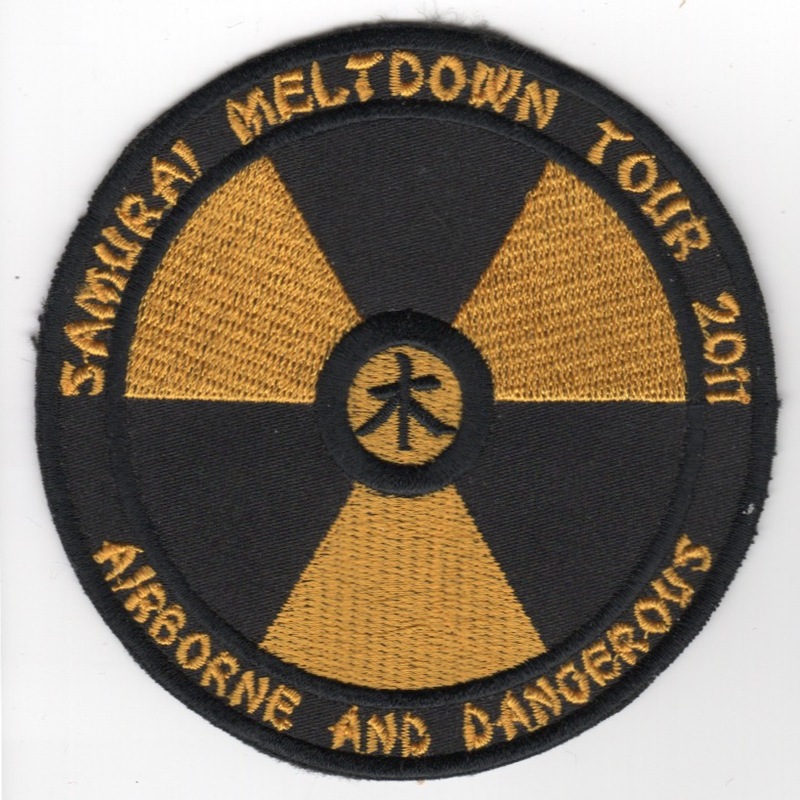 This patch is the "SAMURAI MELTDOWN TOUR 2011" patch and was found in a Korean embroidery shop in very limited quantities. This patch does not come with velcro attached. (Korean): The 14FS is part of the 35FW at Misawa Air Base, Japan. They operate the F-16 Fighting Falcon aircraft conducting Wild Weasel missions. The squadron has been stationed at Misawa since 1987. The squadron was deactivated, but then reactivated in 1987 as the 14TFS at Misawa Air Base, initially training for close air support using conventional weapons. They also provided for the air defense of northern Japan. 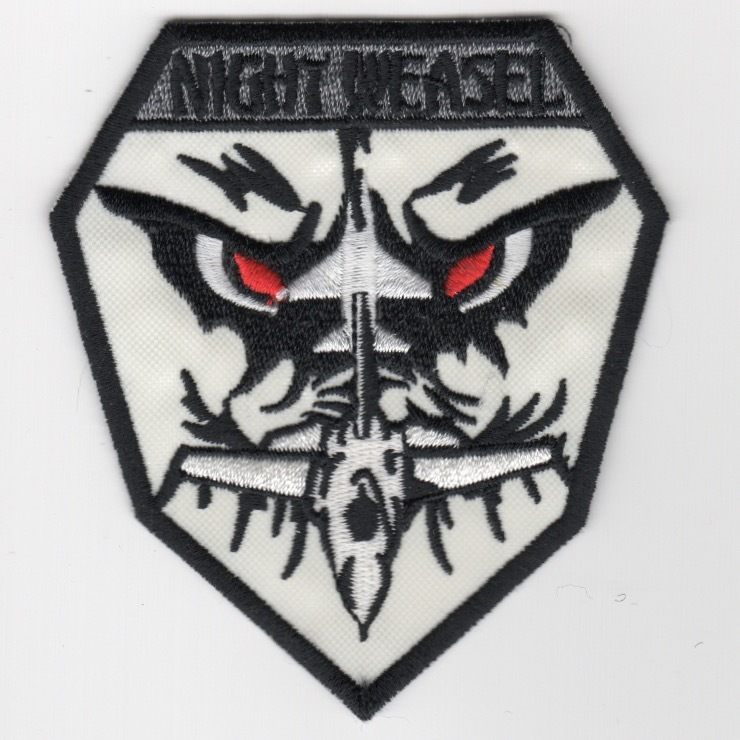 This patch is the white 'diamond' version of the "NIGHT WEASEL" patch and was found in a Korean embroidery shop in very limited quantities. This patch does not come with velcro attached. (Korean): The 14FS is part of the 35FW at Misawa Air Base, Japan. They operate the F-16 Fighting Falcon aircraft conducting Wild Weasel missions. The squadron has been stationed at Misawa since 1987. The squadron was deactivated, but then reactivated in 1987 as the 14TFS at Misawa Air Base, initially training for close air support using conventional weapons. They also provided for the air defense of northern Japan. 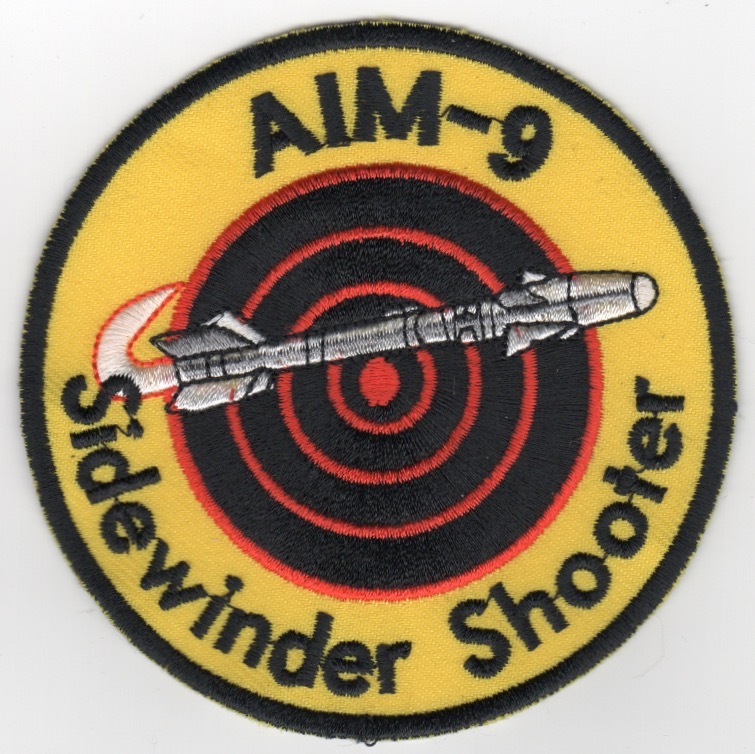 This patch is the AIM-9 Sidewinder Shooter patch given to those aircrew who were selected to fire this missile. It was found in a Korean embroidery shop in very limited quantities and does not come with velcro attached. (Korean): This squadron was first activated at Colorado Springs, Colorado in June 1942 as the 14th Photographic Reconnaissance Squadron. 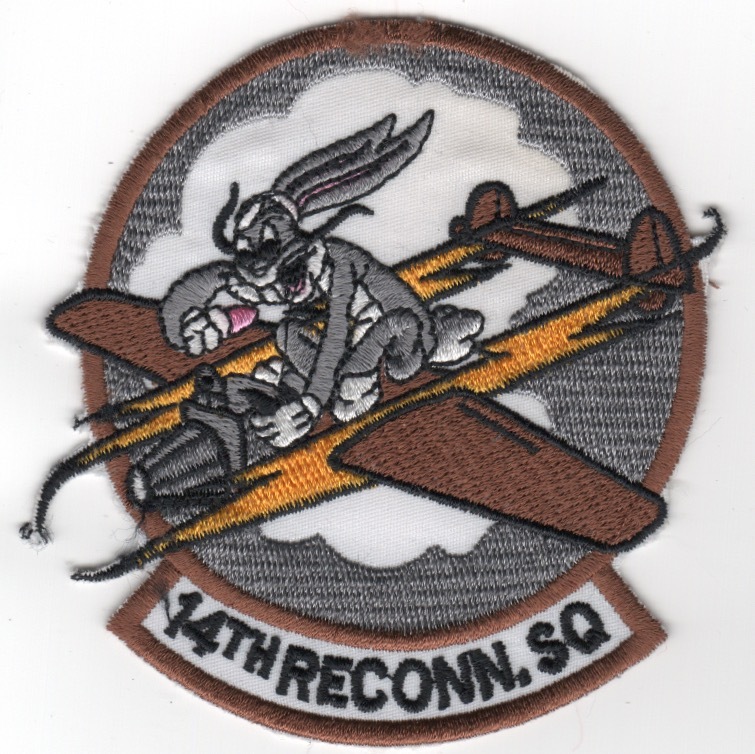 The 14th flew combat reconnaissance missions in the European Theater of Operations from 12 August 1943 until 25 April 1945. After the War, the unit turned its aircraft in to depots during the late summer and early fall of 1945. Squadron personnel returned to the United States and the unit was inactivated at the Port of Embarkation in December 1945. Futher information of this squadron's lineage is above and online. This is the "historical, throwback" patch created to commemmorate their history. It was found in a Korean embroidery shop in very limited quantities and does not come with velcro attached. 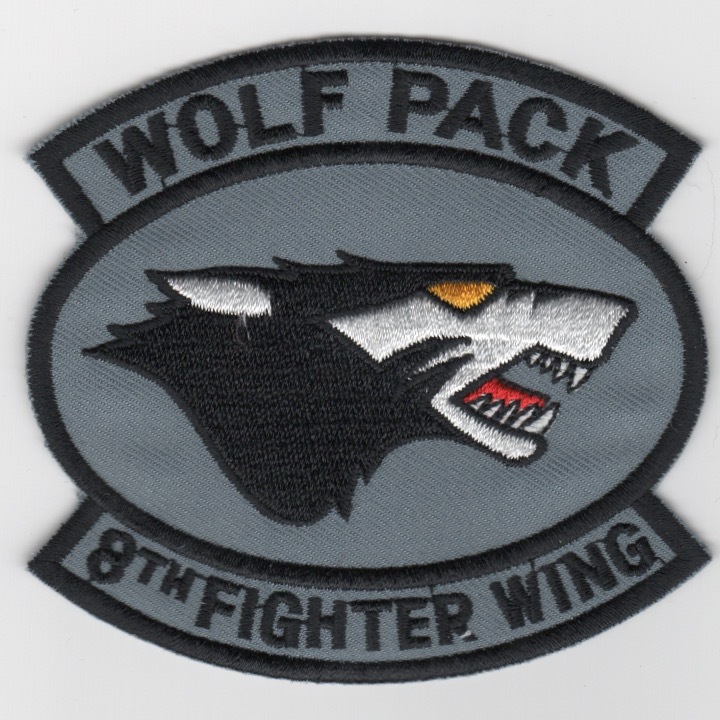 This is the subdued version of the current squadron patch for the 18th Fighter Squadron. 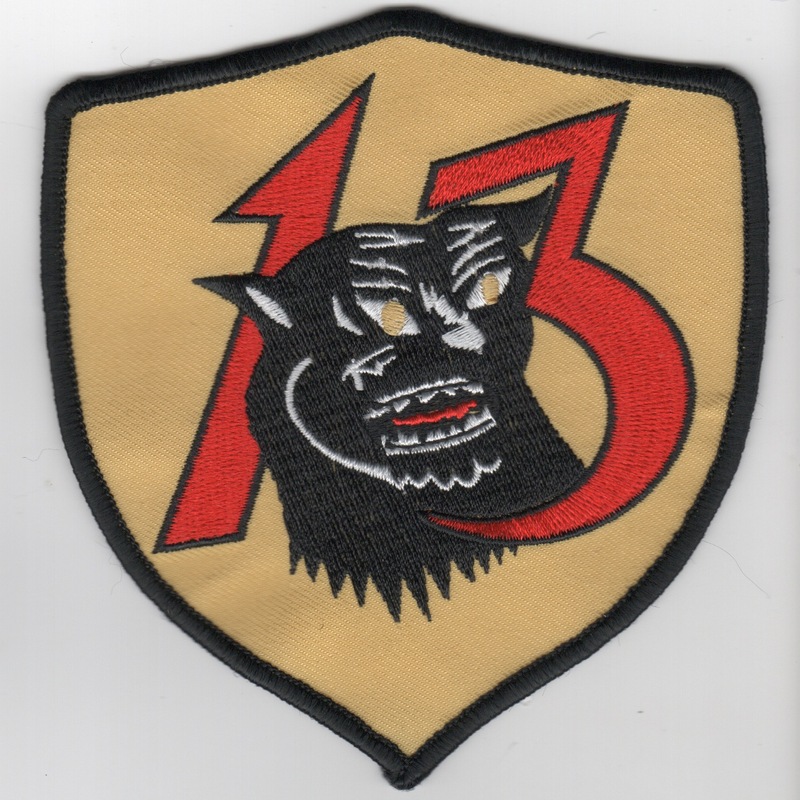 This is the squadron patch for the 18th OSS that supports the F-16 Wing out of Kadena, Japan. This is the blue version of the ops group patch for the squadrons stationed at Shaw AFB, SC. It shows a "mushroom cloud" in the background, and has all the "mascots" combined. (Korean): The 22d Fighter Squadron is an inactive United States Air Force unit. They were last assigned to the 52d Operations Group and stationed at Spangdahlem Air Base, Germany. In April 2010, 20 F-16Cs were flown from Spangdahlem to the 148FW of the MN ANG, with one F-16 transferred to Edwards Air Force Base, CA. As a result of the drawdown of F-16s, the 22d and 23rd Fighter Squadrons were inactivated on 13 August 2010 and formed a single "new" squadron, the 480FS. At various times during its existence, the squadron has gone by colloquial names "Stingers", "Adlers", "Bees", "Bumblebees" and "The BIG 22: Last of the Red Hot Fighter Squadrons. 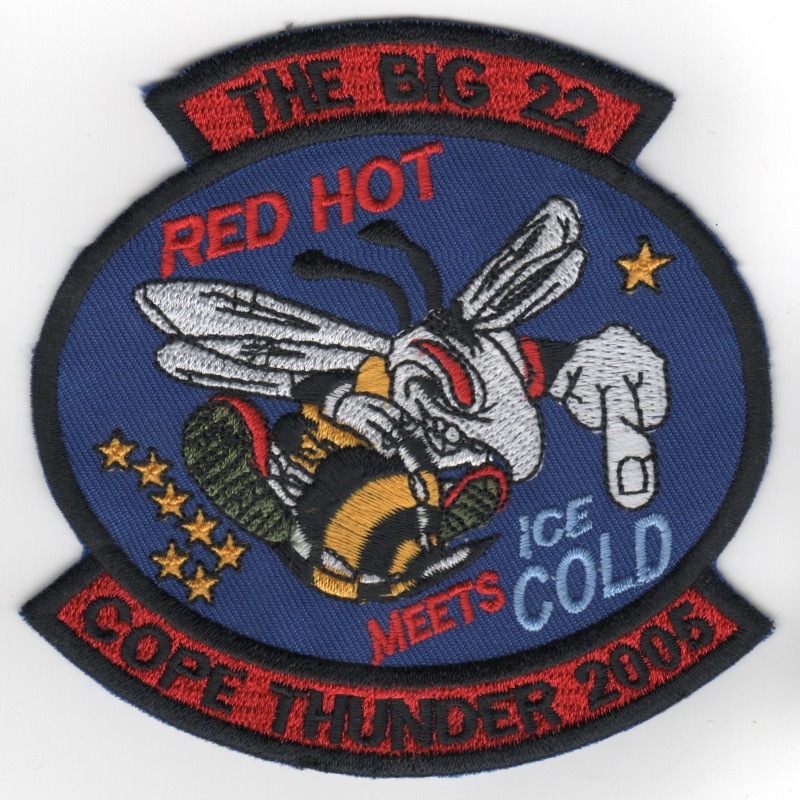 This patch is the 2005 'COPE THUNDER' Exercise patch found in a Korean embroidery shop in very limited quantities and does not come with velcro attached. 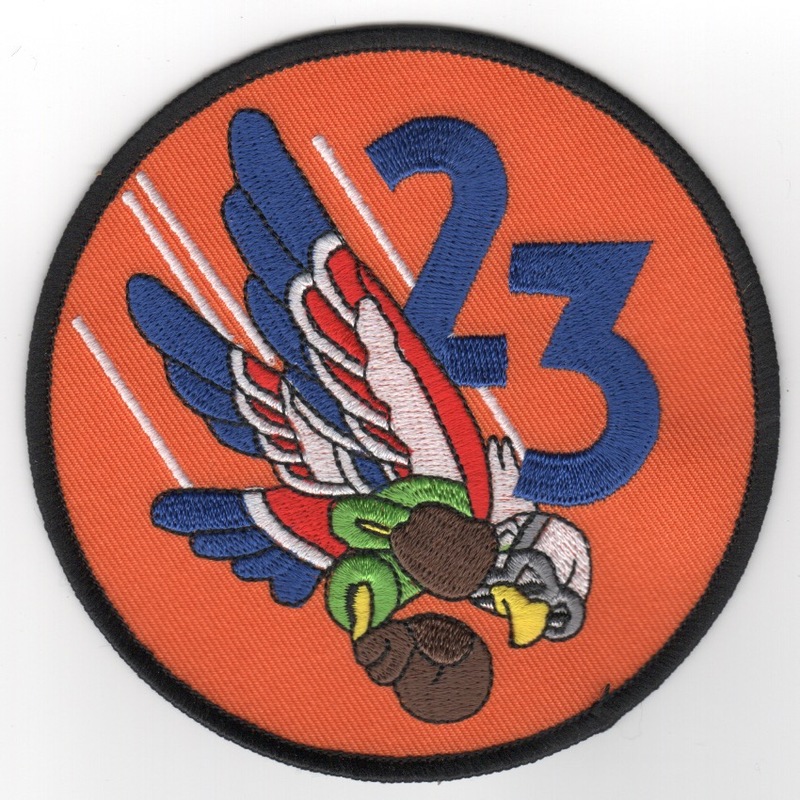 This is the 'orange' version of the current squadron patch for the 23rd Fighter Squadron (The Bird with the boxing gloves on orange background). They are actually stationed in Germany at Spangdahlem AFB and this patch does not come with velcro attached. (Another AV8RSTUFF Creation): The 23FS is an inactive USAF unit. It was last assigned to the 52d Operations Group and stationed at Spangdahlem Air Base, Germany. In April 2010, 20 F-16Cs were flown from Spangdahlem to the 148FW, MN ANG, with one F-16 being transferred to Edwards Air Force Base, CA. They were inactivated on 13 August 2010A and as a result of the drawdown of F-16s, the 22nd and 23d Fighter Squadrons and their personnel and equipment were used to form a single "new" squadron, the 480th Fighter Squadron. This is the desert version of their squadron patch and does not come with velcro attached. This is the Operation Allied Force patch for the Combat Stawks Makos that fly the F-16. The "Combat Stawks" are the 23rd Expeditionary Fighter Squadron, based out of Spangdahlem AB, Germany. This is the old blue version of the ops group patch for the squadrons stationed at Cannon AFB, NM. It shows the F-16 and F-111 aircraft on the patch flying in front of the NM sun. (Korean): The 34FS is part of the USAFs 388FW at Hill Air Force Base, UT. On 2 August 2016, the Air Force announced that the 34FS had become the first squadron to achieve initial operating capability with the F-35A, the Air Forces variant of the F-35 Lightning II. With an operational history extending back to World War II, and including the Cold War, Vietnam War, Operation Desert Storm, Operation Southern Watch, Operation Desert Fox, Operation Noble Eagle, and the Afghanistan War, it had most recently operated F-16 Fighting Falcon aircraft on air superiority missions prior to its reactivation as an F-35A squadron. This patch was "mis-spelled" (unintentionally), but many collectors like to have "mistakes". This patch was found in a Korean embroidery shop in very limited quantities, has the "in- theater-made" feel to it, and does not come with velcro attached. 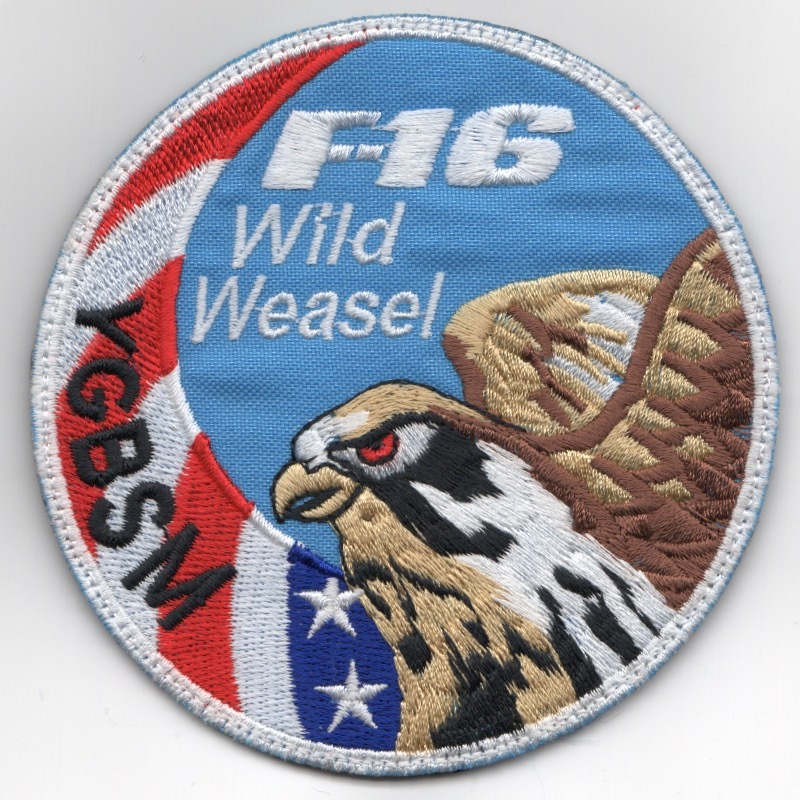 (Korean): This is the F-16 'Wild Weasel/YGBSM' Swirl patch for the 35FW. The 35FW is an air combat unit of the USAF and the host unit at Misawa Air Base, Japan. The wing is part of Pacific Air Forces (PACAF)'s Fifth Air Force. The wing was first activated in August 1948 at Johnson Air Base, Japan when PACAF implemented the wing base organization. It participated in the Korean War and later served in the air defense of Japan until inactivating in 1957. In 1966, the wing was again activated and served in combat in the Vietnam War until inactivating in 1972 with the withdrawal of US forces from Southeast Asia. It was soon reactivated at George Air Force Base, California, where it served until inactivating in 1992. It was again activated the following year in Iceland as an air defense unit, but with the drawdown of US forces in Iceland, it was inactivated the following year, but reactivated the same year at Misawa. The 35FW was redesignated and reassigned 1 October 1994 when it inactivated at NAS Keflavik and was reactivated the same day at Misawa Air Base, Japan where the wing assumed the missions and responsibilities previously performed by the 432d Fighter Wing. This patch was found in a Korean embroidery shop in very limited quantities, has the "in-theater-made" feel to it, and does come with velcro attached. (Korean): The 35FS is a USAF unit, assigned to the 8th Operations Group, stationed at Kunsan Air Base, South Korea. The squadron operates the General Dynamics F-16 Fighting Falcon aircraft conducting air superiority missions. This is the gray oval version of their squadron patch and was found in a Korean embroidery shop in very limited quantities, has the "in-theater-made" feel to it, and does not come with velcro attached. 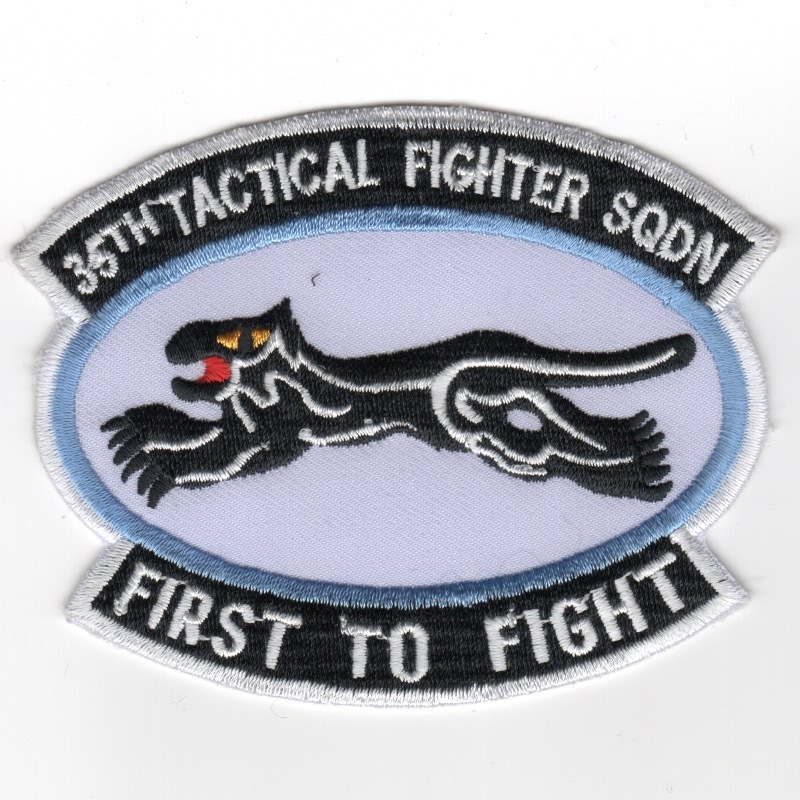 (Korean): The 35FS is a USAF unit, assigned to the 8th Operations Group, stationed at Kunsan Air Base, South Korea. The squadron operates the General Dynamics F-16 Fighting Falcon aircraft conducting air superiority missions. I only have two of these, so email me to see if in stock!! This patch was found in a Korean embroidery shop in very limited quantities, has the "in-theater-made" feel to it, and does not come with velcro attached. (Korean): The 35FS is a USAF unit, assigned to the 8th Operations Group, stationed at Kunsan Air Base, South Korea. The squadron operates the General Dynamics F-16 Fighting Falcon aircraft conducting air superiority missions. 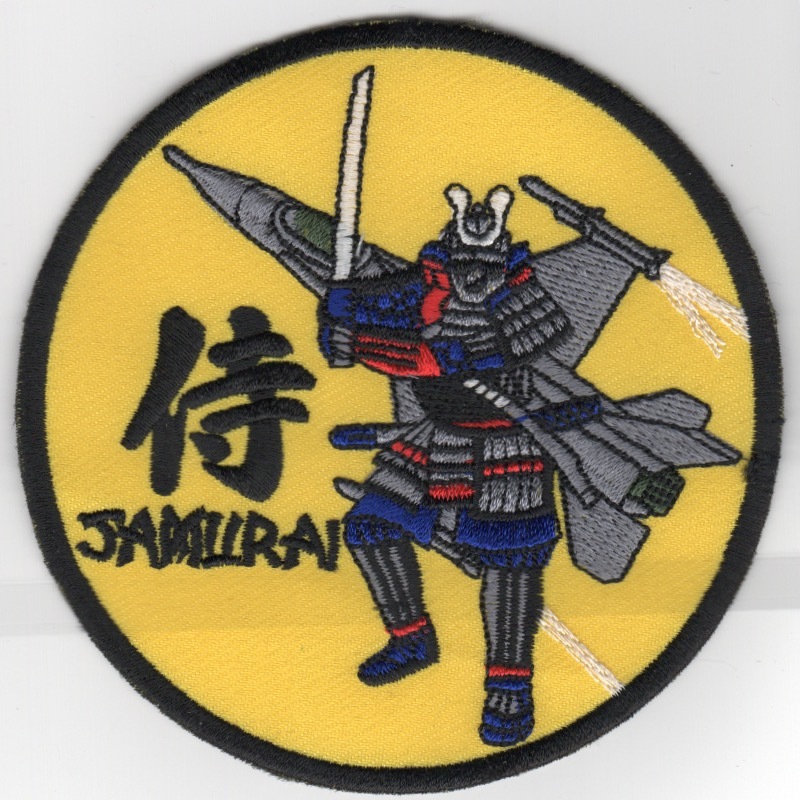 This is the TACTICAL FIGHTER SQUADRON version of their squadron patch and was found in a Korean embroidery shop in very limited quantities, has the "in-theater-made" feel to it, and does not come with velcro attached. 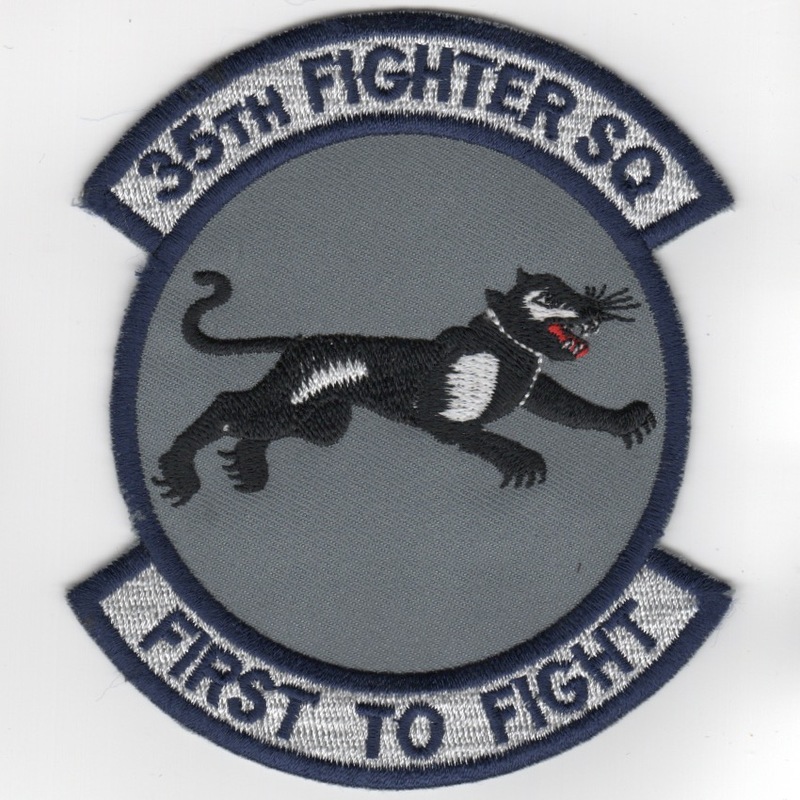 (Korean): The 35FS is a USAF unit, assigned to the 8th Operations Group, stationed at Kunsan Air Base, South Korea. The squadron operates the General Dynamics F-16 Fighting Falcon aircraft conducting air superiority missions. 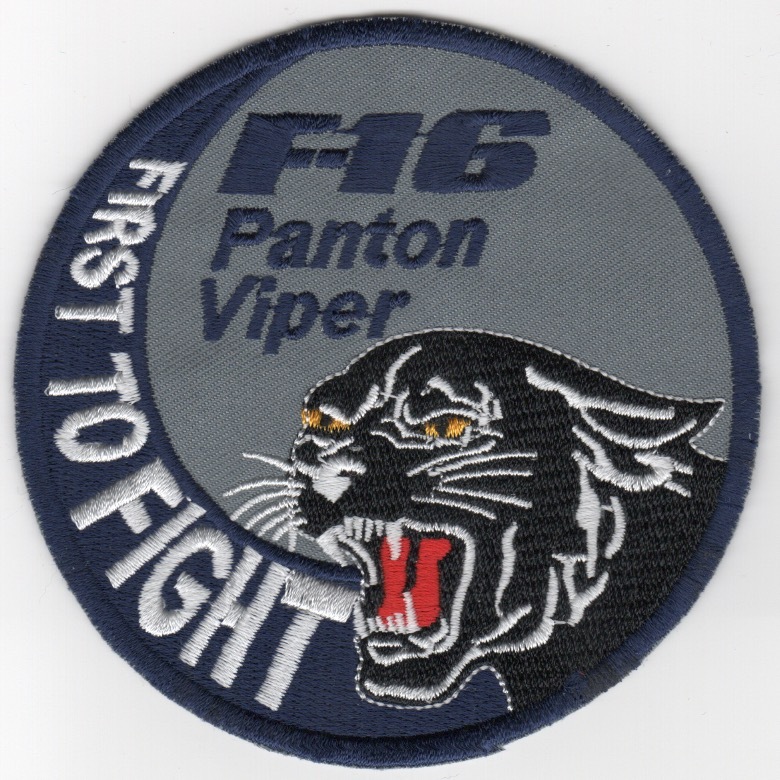 This is the gray/blue version of their 'FIRST TO FIGHT' swirl patch and was found in a Korean embroidery shop in very limited quantities, has the "in-theater-made" feel to it, and does not come with velcro attached.